Description: self-seeding winter annual (6-10") with delicate, bright green foliage and large yellow flowers with white tips in spring. Beautiful en masse! Lovely edging plant in sunny border. Meadowfoam is a good nectar-source for bees, butterflies, and hoverflies. 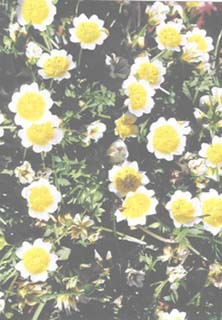 Sun, regular water (loves wet sites), well-drained soil.